I wanted to checkout some snapshots for 1.13, 17w47B, however once I booted up minecraft, absolutely nothing had a texture. Not even the home page! 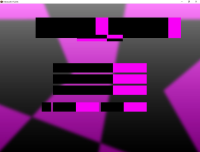 It was just the purple/black missing texture squares. It did this in all 1.13 snapshots. I took a screenshot.